The Palomar Model A Club was formed in 1960 and was originally organized as a Region of MARC (Model A Restorer’s Club). The Club founders wanted to have a statewide Model A “meet” to pick the best Model A in California. The winner of that meet would then go to a national meet to compete with the best cars from all of the other states. 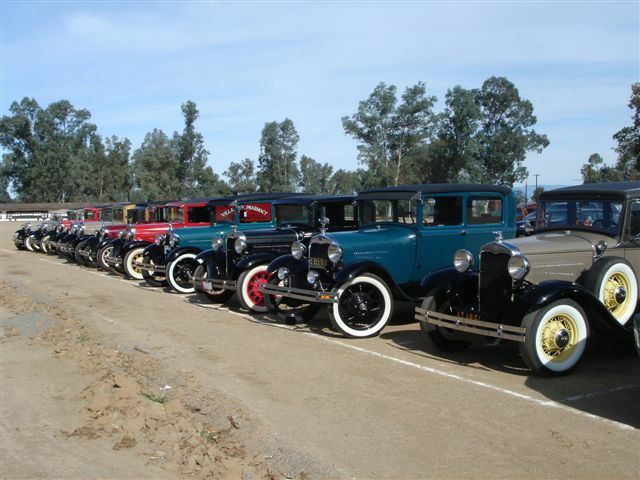 The first meet was held in Fallbrook in 1961 and was called the All California Model A Day and Antique Car Exhibition. That meet still occurs annually today and is called the Fallbrook Car Show. The first year they held the meet, it attracted more than 2,000 spectators, 75 Model A Fords and between 30 and 40 antique and classic automobiles. How has our Club changed over the years? In April 1963, we changed our affiliation from MARC (Model A Restorer’s Club) to MAFCA (the Model A Ford Club of America). Then, in 2010, we decided to establish an affiliation with both organizations, so we are now proud members of both MAFCA and MARC. In January 2016, we discontinued the affiliation with MARC and retained our affiliation with MAFCA. In addition, though our Club was initially organized to sponsor the statewide meet, we have now evolved into a social and touring club. Our Club’s newsletter also changed from the “Palomar Region Bulletin” to “The Reflector”. The above history was provided by the Palomar A’s Librarian/Historian, John Frazee.